Despite a remoteness from human activity, you’ll never feel alone on a Magpie River Adventure. Many impressive and hardy animals call the surrounding country home. Thick boreal forests line the river creating dark protective shadows. As we float by, it’s not hard to imagine several sets of eyes watching our strange, bulbous crafts. Spotting these well-camouflaged forest inhabitants takes keen sight and a bit of luck. 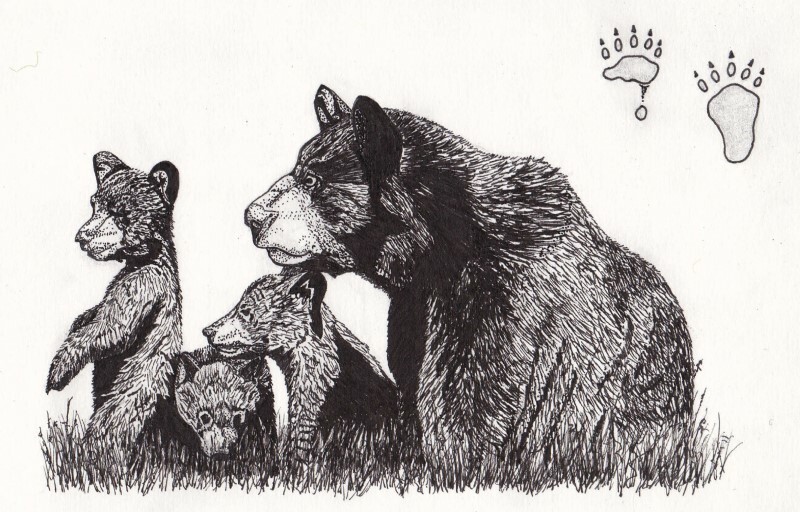 Even with animals as large as black bears and caribou. That’s why it’s a special moment, anytime we catch a glimpse (and hopefully a photo). To let you get to know the Animals of the Magpie a little better, we’ve highlighted 5 of our favourites. As key boreal forest species, they help make Magpie River ecology so fascinating. Habitat and Range: Tundra and coniferous (especially “boreal”) forest in Canada, Alaska, and pockets of northern Idaho. Diet: Depending on the season, caribou feed on sedges and grasses, alder leaves, mushrooms, lichens (particularly in winter), willow catkins, cotton grass, horsetails, and dwarf birch. Fun Fact: As an adaptation to the dark northern winter, caribou are able to see ultraviolet light. This allows them to visually perceive things other animals (including humans) can’t like the urine of predators. They can also see lichen, which absorbs UV radiation, as darker patches against the winter snowscape. 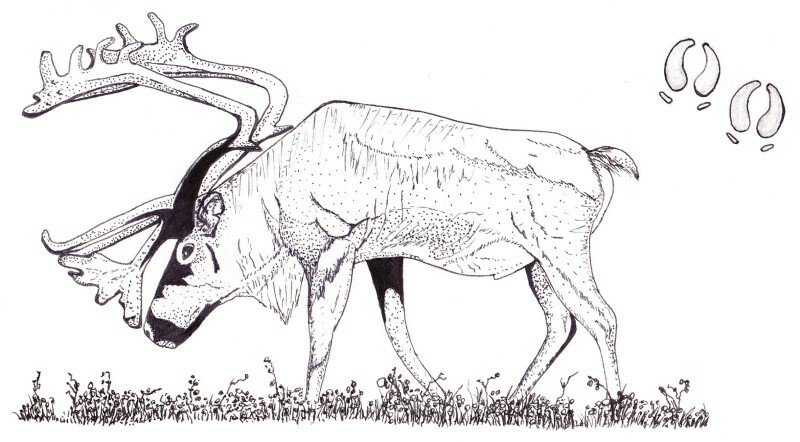 This ability gives caribou a competitive advantage at avoiding encounters with carnivores like grey wolves and finding food when it is scarce or hidden. Habitat and Range: Marshes, ponds and streams across Canada, in Alaska and all United States except Florida and arid parts of the southwest. Diet: A majority of the beaver’s diet is made up of tree bark and the soft tissue beneath the bark called cambium. However, they will also eat water plants, buds and roots. Given a choice of tree bark to eat, beavers are partial to birch, alder, willow, aspen, poplar, maple, beech and cottonwood. Fun Fact: Beavers have lips that can close behind their chisel-sharp front teeth. This lets them move and chew wood underwater without getting anything (like splinters) in their mouths. Habitat and Range: Coniferous forest across Canada, Alaska, United States bordering Canada and south in the Rocky Mountains into Colorado. Diet: The lynx is a very specialized hunter with the snowshoe hare, it’s chosen quarry, accounting for about 75% of its diet. The remainder of the lynx’s diet includes small rodents like meadow voles, birds like grouse and ptarmigan, carrion and occasionally large herbivores like caribou and deer. 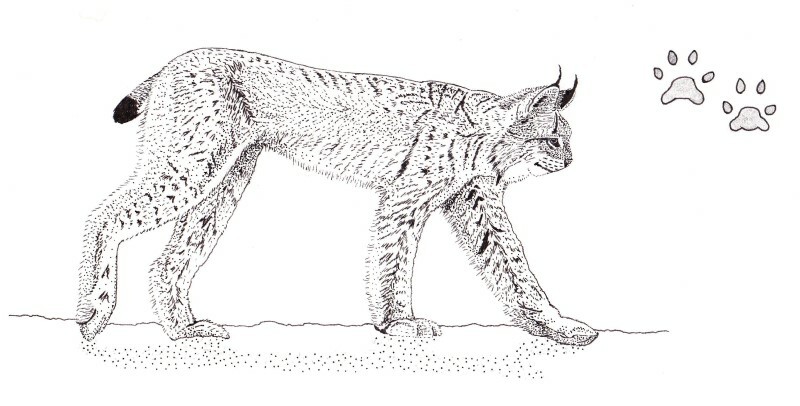 Fun Fact: Different lynx populations have different physical form and appearance depending on climate conditions. More northerly lynx, which must cope with thick snow for longer periods, have lighter colouration, thicker fur, and larger and more padded paws, than their southern relatives. In some cases their paws, which help keep them on the surface of deep snow, are larger than an adult human’s feet. Habitat and Range: Coniferous and deciduous forests across Canada, in Alaska and the northern border of the United States. 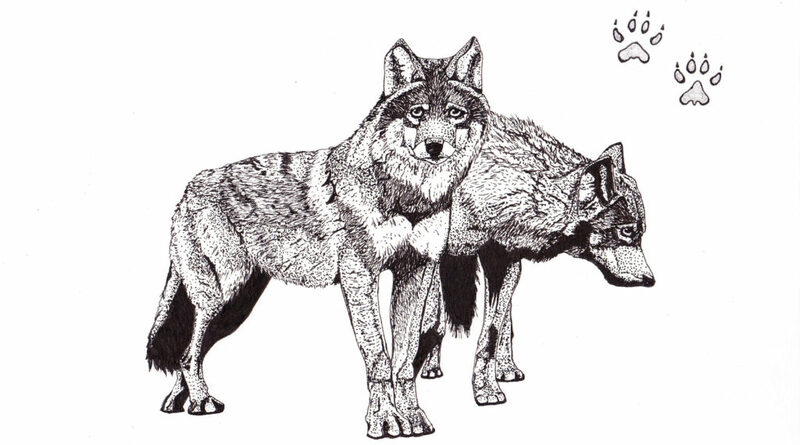 Diet: Grey wolves eat meat, exclusively. By hunting as a pack, they are able to kill larger animals including moose, caribou, deer, bison, elk and musk-oxen. Smaller animals like hares, beaver, small rodents and grouse round-out their diet. Fun Fact: Well-adapted to the periodical feast and famine of the wild, grey wolves are able to fast between meals for up to 2 weeks without damaging their health. Conversely, after a large kill, grey wolves will eat up to 30 lbs in a single sitting. Habitat and Range: Forests and wooded swamps across Canada, the United States, Alaska and northern Mexico. Diet: Black bears are omnivorous, eating fruits, nuts, berries, insects, fish, small mammals, carrion and honey. In rare instances they will prey on juvenile moose and deer. Their sensitive noses allow them to find food over large distances and in less obvious places (like ant-colonies hidden in rotten logs). Fun Fact: In autumn, black bears may spend up to 20 hours a day foraging. During this time they will increase their body weight by 35%, building up fat-stores to survive the long winter. Habitat and Range: Native to eastern North America in Canada and the United States but introduced to Europe, Asia and elsewhere in North America. The Brook Trout is at home in all kinds of clear, freshwater, including rivers, streams, lakes and spring ponds. They are also, by far, the most commonly reeled-in fish on the Magpie River. Diet: In their youth, brook trout mostly eat small insects. Once they reach maturity, their diet broadens to include minnows and other small “bait” fish, worms, snails, and a full range of aquatic insects. 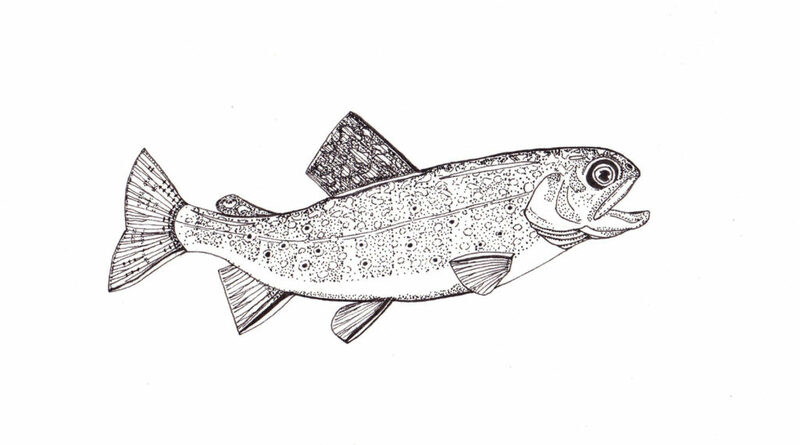 Fun Facts: A brook trout is actually not a trout at all, but a type of “charr” (albeit the most trout-like charr out there). They can also live up to 9 years while growing to nearly 3 ft and 14 lbs. Don’t panic. Being calm, cool and collected is the key to not startling the potential subject of your photo-shoot. If you’re in a raft, “stealthily” get your guide’s attention so they can steer the raft to the perfect distance and angle. And so they can quiet down the rest of the crew. The same goes if you’re in an armada of packrafts. Except you need to do the precision paddling. If you’re on land, assess the situation for your own safety and everyone else’s. Then get a guide’s attention so they can double-check your assessment and gather other nature-lovers. This is a good one to have a predetermined, but unobtrusive signal (like making the sound of a chipmunk) that lets your team know what’s up. If you’re too close to the animal, or in its path, calmly give it some space. Keeping your eye on the animal to judge its reaction. If you’re on the water, it’s usually not difficult to get away quickly. Particularly with the help of the current. If you’re on land, you can give space while walking calmly toward your basecamp. From there, if the animal needs even more space (e.g. is extra curious or rambunctious), you and your team can make a swift escape onto the water by raft or packraft (always kept near the water’s edge). However, in most cases, it’s the wild animal that will be scared away by a large and boisterous group of rafters. Step 4: Observe the wonder of nature! Once your distance is safe, silently take out your camera and fire away. Or just enjoy watching a wild animal in its natural habitat. For the brook trout, it’s probably best to fine-tune your fishing game, and reel one in, if you want a closer look and a photo. If you notice a creature during your flight in, you’re probably good to skip straight to step 4… and to be as loud about it as you like. Want to experience these boreal forest animals first-hand? Join us on this summer’s Magpie River Adventure or Magpie Packraft Expedition.